A popular explanation for the ongoing economic slump is that the United States is in the midst of a balance sheet recession. This view holds that the vast amount of household debt built up during the housing boom is now being unwound and that this deleveraging is creating a drag on the economy. Though intuitive, this balance sheet recession view is inadequate because one, it ignores the potential offset in spending by creditors and two, it misses a more fundamental problem: the elevated demand for liquidity. I believe one of the reasons for this confusion is that advocates of the balance sheet recession view tend to focus on the liability side of household balance sheets while ignoring the details of the asset side. 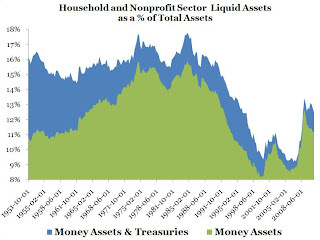 A close look at the asset side reveals that despite the collapse in overall household assets, there has been a inordinately large buildup of liquid assets. 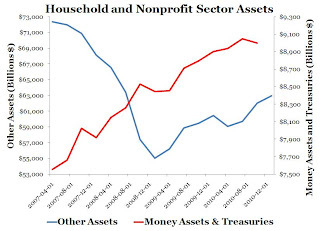 It is this accumulation of money and money-like assets rather than the deleveraging itself that has kept nominal spending from experiencing a robust recovery. Here are the numbers. 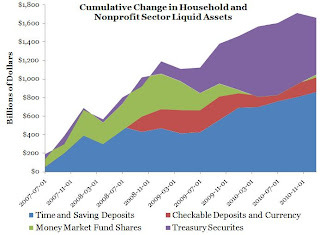 The composition of the increase in liquid assets is also interesting. Most of the increase has come in the form of time and saving deposits, though treasuries have been important too. 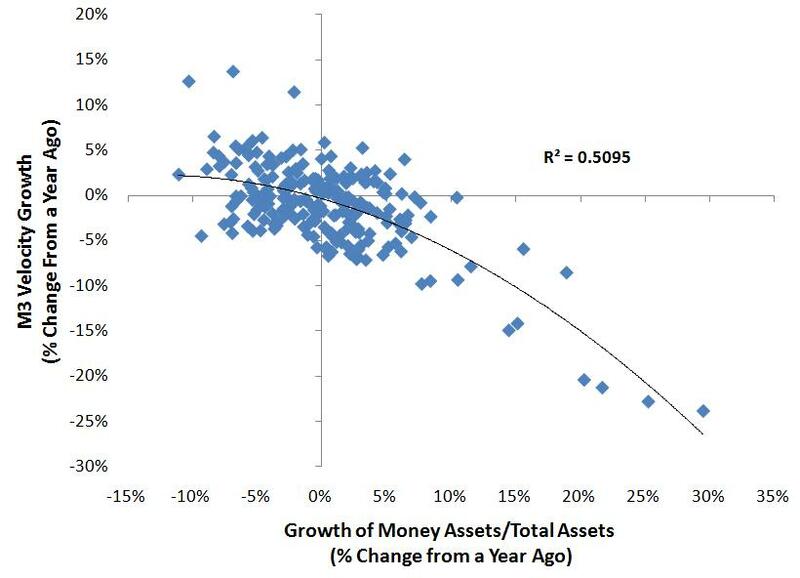 Money assets alone (cash, checking account, time and saving deposits, money market accounts) have remained elevated and close to their peak value in late 2008. And, as John B. Taylor notes, money demand appears to be growing even more. 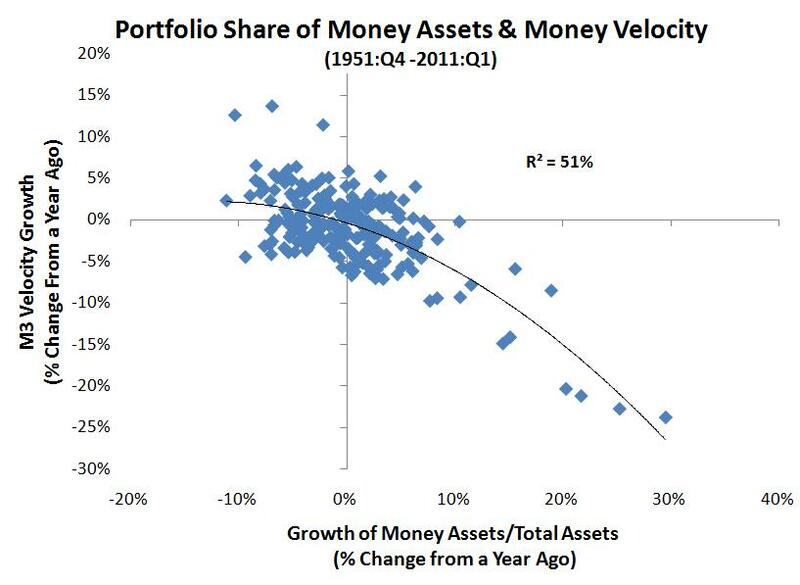 I personally place more importance on the growth of the money assets in slowing down nominal spending for two reasons. First, they are fixed in nominal value and thus only grow by households actively acquiring them. Treasuries, on the other hand, may be increasing through acquisition and valuation change. Second, the demand for liquid assets in general can only affect nominal spending by influencing the medium of exchange, money. It is the only asset on every other market and thus is the only asset that can directly affect nominal spending. An elevated demand for treasuries matters, then, by affecting the demand the money. 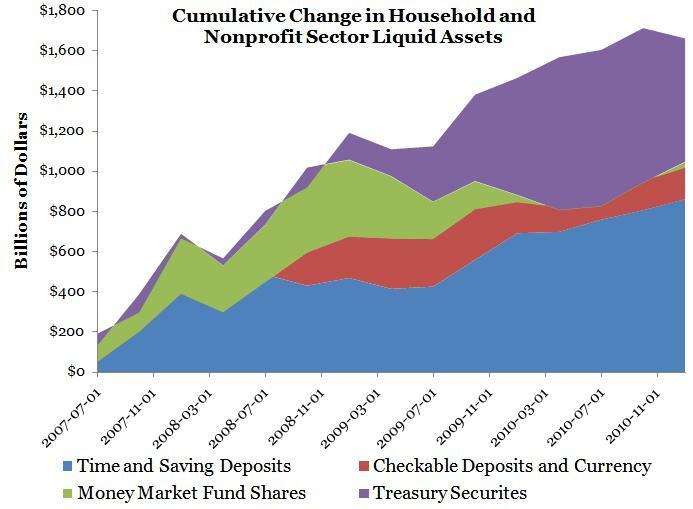 As a share of total assets, household’s liquid assets have risen and remained elevated as seen in the figure below. Now some may note that the rise in the share of liquid assets is not all that large in terms of percentage points. A rise in the share of liquid assets, however, does not need to be terribly large to impede nominal spending. This is especially true with money assets because they are the medium of exchange. One would expect nominal spending to be sensitive to changes in money demand. The figure below confirms this. 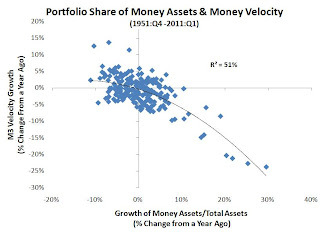 It shows the relationship between the growth rate of money assets as share total assets and the growth rate M3 velocity for the period 1951:Q4 through 2011:Q3. (The M3 data comes from NowandFutures.) The relationship is surprisingly strong, given that money velocity can also be affected by factors like innovations in financial transactions. 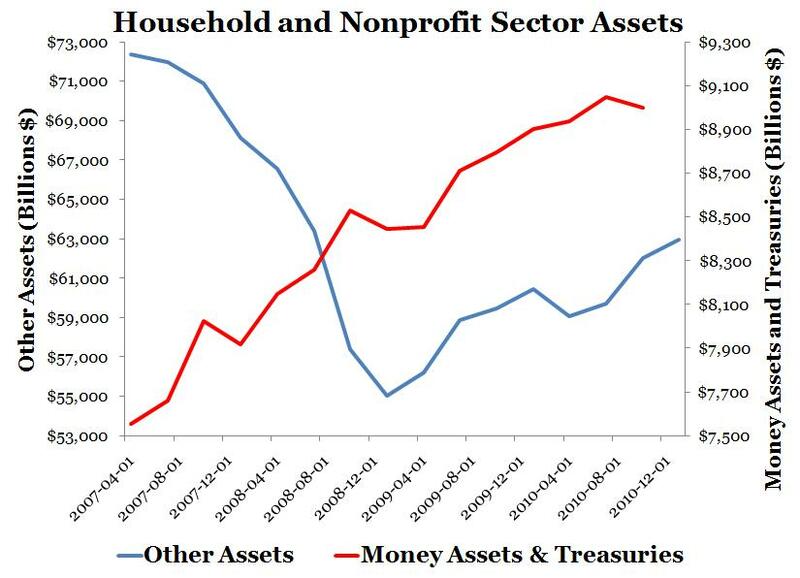 Observers, therefore, need to be paying more attention to the build up of money assets in household balance sheets. Until this development changes, there will be an ongoing drag on nominal spending. One way to address this problem is to introduce a nominal GDP level target. This is how it would work in practice. Update: In the comment section I further explain why excess money demand rather than deleveraging is the reason for the weak aggregate demand. This post originally appeared at Macro and Other Market Musings and is reproduced here with permission.